Summer is over, children are back in school…and it won’t be long until the real countdown to Christmas begins. That means thousands of Irish couples and families will soon be booking short trips to Christmas Markets all over Europe. The travel industry reports this has been a growing trend in the past decade, with more and more people experiencing the festive atmosphere in a foreign city each year. One of the originals, and still one of the best. Munich’s city records show a ‘NicholasFest’ being held as far back as 1642. Markets now are centred round a 100-foot Christmas tree in the Marienplatz. Highlights include the Krampus Run, featuring large puppets of the characters from German folklore who are said to scare naughty children in the run up to Christmas. So make sure you’re nice, not naughty! The Munich Christmas Market will begin this year on November 27. 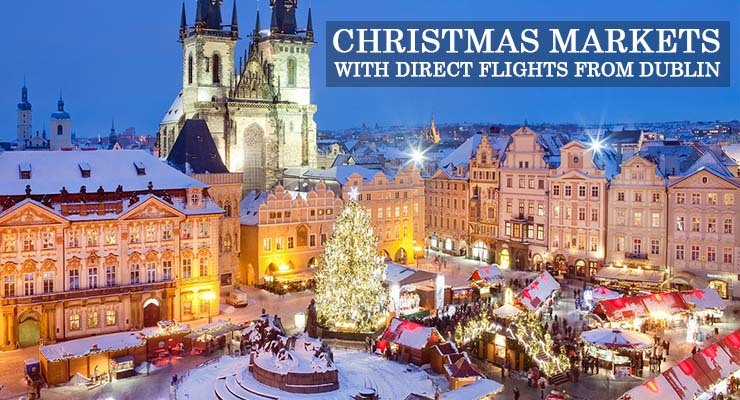 Charming Prague is ideal for a visit at any time of year, but especially as Christmas approaches. Its Christmas Market in the Old Town Square is held over a smaller area than many others, but that serves to make it more cosy and convivial. A second market is also held at Wenceslas Square in the New Town – where there’s an obvious link to the festive season! This year’s Prague Christmas Markets will begin on December 2. Budapest is popular with Irish people all year round, and no less so at Christmas. A highlight here is how the 18th century Gerbeaud House is transformed into a giant Advent Calendar, with a window opening at 5 p.m. each day to reveal a new painting with a Christmas theme. Stroll along the banks of the Danube and browse the crafts stalls in Vorosmarty Square for a perfect souvenir of your trip. The Budapest Christmas Market will begin on November 10 this year. Charming Vienna is as close to a perfect setting for a Christmas Market as you will find. The City Hall Square is turned into a shining fairytale land, and the aroma of the city’s famous pastries will keep you wanting more no matter how much you’ve already eaten! Vienna is also a great destination for a ‘two for one’ trip. The Christmas Market in Bratislava – capital of Slovakia – is just an hour away by train. And for something closer to home! Manchester was the first UK city to embrace the Christmas Market phenomenon, almost 20 years ago now, and it continues to grow bigger and better every year. Browse more than 300 beautifully crafted stalls in the city centre, offering food, drinks, and Yuletide gifts. Also enjoy open-air concerts and a large ice rink. This year’s Manchester Christmas Market will open on November 10. If planning on visiting a Christmas Market this year, remember make sure you and your companion(s) are carrying comprehensive travel insurance for the trip. It may be just a short break, but it’s important to have cover whenever away from home. You need to be protected in the event of an accident or something else going wrong. All are as generous or more generous as you will find with any other travel insurance provide. They all add up to even more great reasons to choose Insuremyholiday.ie for all your travel insurance needs.